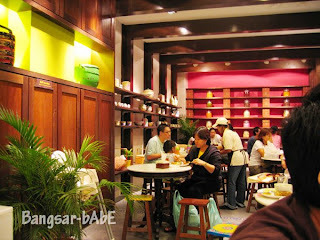 We were in Mid Valley a couple of weeks back when rif and I decided to try Nyonya Colors. 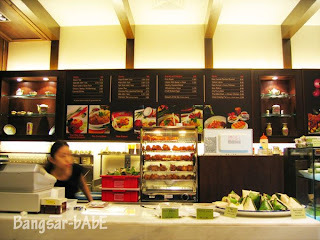 Located at the lower ground floor of The Gardens, they also have an outlet (main branch) in 1 Utama, Old Wing. 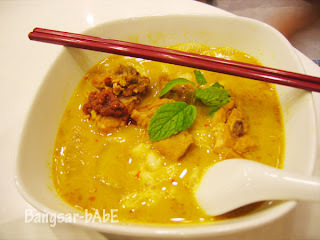 I tried the Yellow Curry Laksa while rif went for the nasi lemak with rendang chicken. The laksa was quite fragrant albeit slightly small in size. Garnished with mint leaves and topped with sambal, I thought it was rather disappointing. The broth was too mild and the sambal provided didn’t quite make the cut. rif tried it and said it was OK though. His nasi lemak was also very ordinary. 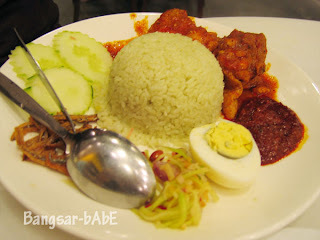 The rice was not cooked with coconut so it wasn’t really “nasi lemak” in my book. The rendang chicken was not bad, quite aromatic and rich in flavour. The sambal was on the sweet side and wasn’t spicy enough. Our meal cost us RM 22.60 (tax included). It was quite a disappointing experience as I expected more from this place judging from the big crowd at the 1 Utama outlet. However, don’t let my comments deter you from trying this place. Verdict: Overpriced and not quite to my liking. I’d rather go to Baba Low at Lorong Kurau, Bangsar. Well i guess this place is more popular for its “kuih” rather then its main course. Hmmm…I find their kuihs overpriced. RM 0.90 for a small piece? How can?